Do you spend the majority of your life trying to move away from pain or towards satisfaction? This experience of life – feeling scared, pressured, numb, frustrated and angry or having an underlying feeling of panic could be labelled as signs of lack of self confidence or low self esteem. Your life has become centred around the agreement, approval and recognition of other people. You learned early in life that unless you are pleasing ‘them’ or ‘doing the right thing’ in other people’s view, you will feel uncomfortable and ill at ease, and will attract unpleasant experiences – punishment, disapproval, being ignored or dismissed amongst others. The last thing you would ever want to do is to say no. You have created that other people’s opinions and judgements about things are of greater value than your own. You have to always be on the alert for feedback from your environment as to whether you have pleased other people or not – you are constantly looking out to ensure that you have done enough to keep whatever ‘dragon’ you have created satisfied. You create people around you as being more powerful, more authoritative, more ‘right’ than yourself. This however is an exhausting strategy for survival. In your efforts to ‘feed your dragon’, you give away a lot of your personal power. This strategy will help you survive, and you could live your whole life from this perspective, but is very damaging in the long term if you are interested at all in being at your best and experiencing life at a higher level than just survival. A large part of being at your best involves being aware of and using your innate personal power – listening to your intuition, trusting your own thoughts and feelings, taking action when and where you want to rather than because someone else has told you to, living your life being true to your values and your own unique contribution to the world. By operating from this perspective, life becomes simpler, clearer, less draining, much more pleasurable, and you find that there is space for inspiration, joy and creativity to emerge. What does it take? Ask yourself ‘what would be empowering right now?’ when you find yourself in situations where you notice that you are suffering, tolerating, or moaning to others about. Listen to the answers (and you may have to ask several times before you go beyond your automatic ego driven survival strategies), and if they feel empowering to you, take action in that direction. You have the answers inside you already – they may just need a bit of help to emerge. That is what I do – I help people to move beyond their current limits and be at their best. Do get in contact if you would like some help on your own journey. Two weeks into the Direction Seminar now, and here is a topic which has come up for several of the participants. It is human nature to collapse thoughts, feelings and facts together when under stress. Under stress, humans tend to act on autopilot, using their previous experience and conditioning to react to circumstances. This is an unconscious process. Imagine something happens that you don’t like. You will almost immediately have thoughts, feelings and judgements about the situation. ‘He did not call when he said he would. He’s unreliable, he doesn’t care, I’m not important to him, he is selfish’. ‘I can’t decide on what to do. I can never decide, I always make the wrong decisions, I cannot be trusted to make good decisions, I’ll get it wrong, and then I’ll look stupid’. Notice the basic information – the facts, or ‘what’s so’? And the rest is thoughts, feelings and judgements about the facts. If you adopt this reactive process, you will experience suffering. Your ego has cut in to protect you, and it does so by preventing you feeling that you are powerless. If you follow this reactive route, you will survive until the next occasion. But you will never move beyond this limiting thinking process, and will always react in the same way when faced with similar situations in the future, and will thus create more suffering. Some people are addicted to suffering. Whatever happens in their lives, they will view it as troubling or stressful. They unconsciously choose to experience suffering, perversely as a way of protecting themselves from the responsibility of making choices, and using the personal power they do not believe they have. If you do not want to endure more suffering in your life, when confronted by situations you do not feel safe, comfortable or at ease with, stop for a moment. Separate the facts from your thoughts and feelings about the facts. Notice that as you do so the feelings and thoughts of panic, disappointment or suffering ease, giving you space to replace them with another interpretation. A different interpretation may give you space to choose the thoughts and feelings you want to engage with rather than your ego automatically taking over and deciding for you. ‘I can’t decide what to do’ might become ‘on this occasion, I’ll dig deep and listen to my intuition for guidance’. You exercise choice, and gain back your personal power. Suffering occurs when you take every thought rushing through your head to be the truth. Your thoughts about situations make you unhappy, not the situations themselves – situations are neutral. Suffering begins when you label a situation with your thoughts as being undesirable or bad. Human beings have a vested interest and attachment in holding on to our beliefs, opinions and judgements about our circumstances – our thoughts – because it makes us feel safe. Holding on can occur in many ways – sentimental attachment to objects or memories, daily routines, beliefs and prejudices, phobias and addictions are all varieties of holding on. They function to build and maintain the view we have of ourselves, and in the end create a tightly held and cherished ego. The things held onto represent how we were at a time in the past. They may have little to do with how we are now, and they limit our ability to vary from habitual patterns and conditioning in the present moment. Practice being aware of your thoughts, then letting go of ones that no longer serve you in your present circumstances. If you want to experience different things in your life, see what thoughts now get in your way, and let them go. Where are you holding on to old behaviours or moods which do not ultimately benefit you? Which of the opinions or attitudes that you frequently display no longer serve you? Under what circumstances do you feel most stressed? It is not the circumstances that are making you unhappy, it is your thoughts about them. Learn to listen to the thoughts that work for you now, and let the ones that don’t pass through. I am lead to believe that most people have something like 86,000 thoughts per day (though don’t ask me how that was measured! ), so let the ones that no longer work for you go through without capturing them and taking them as the truth. And if you would like some help, do give me a call. I may be able to bring some clarity to your situation, and speed up your development. You will recognize a reactive state by the powerful influx of painful emotion or suffering you get from time to time. This can take the form of anger, anxiety, fear, guilt, despair, regret, seeking approval, shame, hatred, frustration and many other similar emotions. It is the activation of your pain body. Your pain body is formed in two ways – by your own experience and by being influenced by other people’s pain bodies around you. Pain bodies are created when you have an experience, mostly as a young child, in which your sense of security is shattered, and you feel humiliated, helpless, vulnerable, powerless or overwhelmed. The events themselves are not ‘graded’ – individuals can experience the same event in very different ways. You inherit your parents’ and other influential people’s pain bodies, because their own pain bodies will define how they behave, and therefore treat you as you grow up. What makes a difference is whether you are able at the time of the event to process your feelings and thoughts around it. If you are, the event is less traumatic, and will have little or no impact on you later in life – it becomes neutral. If, however, at the time, you are unable to process the emotions you associate with the event and let the experience pass through you, the feelings you associate with it will become part of your pain body – they are trapped. Your ego then learns that when it feels threatened, or not safe, it will do its utmost to stop you allowing yourself to feel the ‘unpleasant’ feelings you experienced then. The feelings trapped in the pain body become like an alarm system – when triggers are set off the alarm bells ring and you rush to automatically handle the perceived emergency. For most people this is not done in a conscious way – it is a reactive process. The alarm goes off when you find yourself in a situation where your ego senses it could feel the pain you felt when you were little, so it takes over your being and protects you. Over time, what your ego causes you to do in these situations becomes very predictable – you find yourself doing things that you always have done to avoid feelings you don’t want to experience. To give an example of this, you might have had an event when at primary school that you did not like, for example being bullied. The emotion you associate with that experience is humiliation. You learned at the time to survive that feeling by becoming very angry and violent, which helped you survive then. Later in life, if you get into a situation where you start to feel that you could be heading for a humiliating experience, your ego takes over, and you become very angry, very quickly, possibly violent too. At this stage in your life, this might not be an appropriate response to the situation, but it is so automatic you almost cannot help yourself. The good news is that you can help yourself. The key to dealing with these automatic reactions is to become aware of them. In this way they no longer control you – you start to control them, which gives you space to change your response to one that is more useful in the current circumstances. A Snapaband can help with this, by stopping the automatic train of thought and action, giving you space to put something more productive in place. Words reduce reality to something the human mind can grasp, but cannot describe things in their depth. At best they describe mental concepts. If I say ‘tree’, you have a concept of what I mean, but don’t know exactly what I mean. If I say ‘plumber’, you have a set of thoughts, judgments and concepts of what I am talking about, but you don’t know what that plumber does or what is individual about their style. You work with the projection you have created rather than the person. If I say sitting on beach at sunset is ‘great’, you will have your own vision of this, but it will not be the same as mine, or another person’s. Words can deliver concepts but cannot describe experiences. Experiencing something is far greater than understanding it conceptually, as a series of thoughts in your head. Being with something, free of your preconditioned concepts, thoughts and judgments delivers depth and comprehension at a far greater level. When you look at a situation you may be experiencing some difficulty with, and suspend all thoughts, judgements, beliefs, mental images and concepts about it, you have the opportunity to see it differently. The effect of this is like seeing a television picture in black and white, then in colour – the difference is profound. You had become used to black and white, and it was as good as you thought it could get. But when exposed to a colour television for the first time, there is a new vibrancy and freshness, and you notice all sorts of new things in the picture. I have had numerous conversations with clients over the years, picking their brains and trying to get from them how they would describe what I do. It has been something none of us have been able to do in away such that every person will instantly receive the same message. They can describe their experience, or what they have got out of working with me, but we have come to the conclusion that trying to describe what I do in a way that captures everyone’s attention is impossible, and a waste of time and energy to try and formulate. However, having a conversation with me for half an hour conveys to them what it could mean to them in a way which I could not by bombarding them with ‘power phrases’ or ‘amazing concepts’. Experiencing working together for even only a short time takes them beyond thoughts, concepts and judgements, and provides the space to look at things almost with a new pair of eyes. That is why I don’t start working with a client until we have had an introductory 30 minute conversation, so that they are clear what they are taking on, and get their own flavour of what that could be like for themselves. If you want to experience this transition from black and white to colour (and I understand that all you have to work on here is my description and your thoughts about what I am saying!) when applied to any area of your life, be it work, relationships, direction, money, health or anything else you may be looking for a breakthrough in, please come and join the Direction Seminar starting April 17th in Hamble, Southampton. 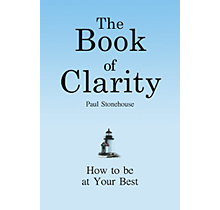 Details are available at www.clarityseminars.co.uk. I cannot describe to you what you will experience – only you will know what that is once you experience it. But I invite you to get in touch with me and have a conversation about what could be possible for you from being in the seminar, and help you choose whether it is for you or not. It may help you go from black and white to colour, and that is worth having in just about anybody’s world.